What you see is not necessarily what you get! Creaing designs on screen is different than creating designs for a "print on demand" product. If you create a design with a brilliant blue color you will see it on the screen in that same brilliant blue color. But it will print blue-grey, not brilliant at all. What happened was you created the design using colors that can appear on your computer screen, but can't be printed. So the color shifts to one that is printable using the available inks and processes for print on demand. Other processes might be able to achieve the desired color, but those are not yet practical in the print on demand environment. important to the design process. "Color space" is the term for the range of colors available in a particular situation. In this case we are concerned with the range of color available on printed objects (CMYK) and the range of colors we see on our computer display (RGB). 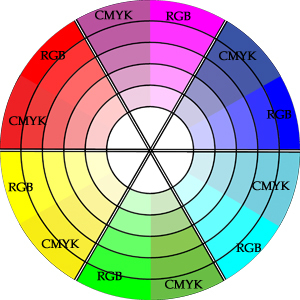 How "important" is it that you understand the difference between RGB and CMYK? It ranges from not important at all to very important. That range is based on whether getting the color you see on screen is very important to you, or not particularly important. My experience is that most customers won't even notice if the color on screen isn't very close to the color in print. On the other hand designers are often quite upset about color shifts. This article covers why those shifts happen and how to design to avoid unexpected color shifts. Opaque physical objects get their color from reflected light. When light hits the object some of the light is absorbed, some is reflected. The color we see is from what is reflected. Everything that is printed on an opaque surface gets its color from reflected light. 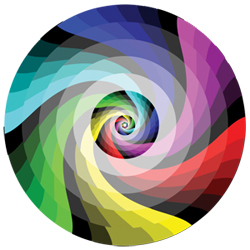 The colors used for our printed products are in what is called the CMYK color space. Our computer display screens, in contrast, emit light so the colors come from emitted light. The colors displayed by our computer display screens are in the RGB color space. RGB and CMYK have colors that they share, and colors that they don't share. If you create a design using RGB colors that are not also in the CMYK color space they will not print they way you expect. The program will select the closest CMYK color and print that instead. To avoid color surprises it is best to design your images in CMYK mode. When you are done designing save the original, then change the color mode to RGB, save that to a different file name and upload that. Here are two color wheels showing the changes to expect when RGB colors are converted to CMYK. In this range there is little or no difference between RGB and CMYK In this range the difference between RGB and CMYK can be very obvious. For this one I took the RGB colors, converted to CMYK and saved to a new document, then converted back to RGB. Then I took the same unconverted RGB image and placed it on top of the converted one. Then I erased the right half of each cell so the the converted color would show through. As you can see the color shift isn't even. Also blues are more affected than reds. To complicate the issue we need to design for CMYK but upload in RGB. The images have to be shown on computer displays so all the colors chosen for designs need to be in both the CMYK and RGB color space. Not all graphics programs have the ability to design in CMYK. In that case really you can only do some guessing. This chart converted RGB "web safe" color values to CMYK. Note in particular that "web safe" does not mean "print safe." That is the point of this chart. It was created in "web safe" RGB values but converting it to CMYK caused the color values to shift. This CMYK chart may be a useful color picker source. If you use the eye dropper tool on that chart you will have CMYK colors. Look at a shirt printed with this image. Photographs are rarely affected by this CMYK issue. Most natural objects are within the CMYK color space already. If your design is a photograph or based on a photograph you can pretty much ignore the CMYK issue. Some people get confused about the upload as an RGB file. They get confused between the file format and the colors contained in that file. The file format is RGB. An RGB file is required and is used as the print source. The images are processed in RGB format. The printer driver converts the RGB color data to CMYK color data. The printer driver will make that conversion based on the recommended inks or pigments used by a particular printer.The printer, however, prints in CMYK. If the colors in that RGB file are in the CMYK color space then the design will print as intended. 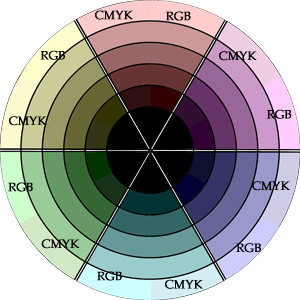 If the colors in that RGB are outside the CMYK color space then the colors will shift. To illustrate this I created this image: Click on the image to get the full sized png version and try printing it on your home printer. Did you get the full color range? Did the star bursts stay distinct from the background?